Labor Day traditionally marks the end of the Summer season in Wisconsin. It may also mark both the beginning of the end of the nonpartisan Government Accountability Board (GAB), established less than nine years ago, and the carving out of a huge exemption for political corruption from being investigated using Wisconsin's unique "John Doe" law, which predates statehood in 1848. 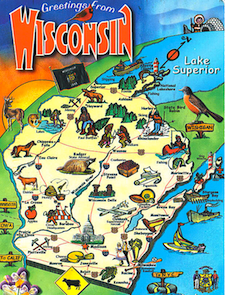 Republicans, controlling both chambers of the Wisconsin Legislature, are bound and determined to make these hyper-partisan measures their central focus for the September floor session, while ignoring economic, educational, environmental and numerous other serious concerns of Wisconsin citizens. Maintaining and consolidating partisan political control, not addressing the real-life concerns of Wisconsin citizens, is apparently the priority of Republicans. 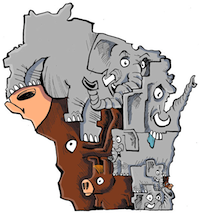 In addition to destroying the GAB and John Doe law, Republicans are expected to also ram through the Legislature their partisan rewrite of Wisconsin's campaign finance laws, once considered among the best in the nation, and likely to be among the worst soon. As we reported to you in our August 13th release, the GAB has been sentenced to death by Governor Scott Walker, Assembly Speaker Robin Vos (R-Rochester) and State Senate Majority Leader Scott Fitzgerald (R-Juneau). CC/WI played a key role in establishing the non-partisan GAB, together with former Republican State Senator Mike Ellis (R-Neenah), and the GAB passed in both chambers of the Legislature with virtually unanimous bipartisan support in January of 2007. But now, Republicans want complete control of all decisions about elections, campaign finance, ethics and lobbying in Wisconsin. It's that simple. It is possible that the GAB could be saved in the State Senate, where 12 of the current 19 Republican Senators voted to establish the nonpartisan GAB in 2007, when they were either in the State Senate or Assembly. If just three of those 12 remained consistent and voted against making the GAB partisan, as Fitzgerald and Vos (who both voted for a non-partisan GAB in 2007) want to do, the GAB could be preserved in its current form. Meanwhile, in late August, an Assembly committee voted along party lines to advance revisions to the long-standing John Doe law, that would essentially exempt political corruption from being investigated by the John Doe, which was effectively utilized to uncover political corruption during the 2001-2002 Legislative Caucus Scandal. Republicans don't like that the John Doe was used to uncover crimes in Scott Walker's office when he was Milwaukee County Executive, sending six persons to jail, or that it was utilized to investigate illegal campaign coordination between Walker's 2011-2012 recall campaigns with outside special interest groups. So, in the form of Assembly Bill 68, they want to exempt any political crimes that they might commit from being investigated utilizing the effective and efficient John Doe investigatory process. Oh, by the way, the GOP is fine with keeping the John Doe process in place for any crimes that non-politicians might be investigated for. Just not them. Earlier this year, former long-time Milwaukee County District Attorney E. Michael McCann, who prosecuted former Democratic State Senate Majority Leader Chuck Chvala for felony misconduct in public office in the Legislative Caucus Scandal of 2001-2002 (charging Chvala with 20 felonies, including extortion), testified against Senate Bill 43, the identical companion legislation to Assembly Bill 68. McCann, a current member of the Common Cause in Wisconsin State Governing Board, made a compelling case against this special carve out exemption for politicians, which you can read in full, here. Senate Bill 43 and Assembly Bill 68 are likely to be scheduled and rammed through the Legislature in September by majority Republicans, unless they come to their senses first. Or, are pressured by their constituents to leave the John Doe process as is. The latter scenario is more likely to occur than the first, at this point. But only if citizens raise their collective voices and are heard (and heeded). Finally, Republicans are secretly preparing legislation in which they are completely rewriting Wisconsin campaign finance law. This legislation could be unveiled and put on a fast track for consideration and passage this month. It is widely expected that they will codify into law the use of secret money by outside special interest groups so that citizens will have no clue who is trying to influence their vote. Contribution limits are expected to be at least doubled, but will effectively be made meaningless because it is expected the GOP will legalize the currently illegal practice of coordination and collusion between a candidate's campaign with an outside special interest group for issue advocacy. Only communications that utilize "express advocacy" or explicit terms like "vote for" or "defeat" will be subject to illegal coordination, terms which most campaign communications currently don't use now anyway. So, virtually complete deregulation of all limitations and unlimited secret special interest money is likely to be encouraged under the expected Republican rewrite. In March, CC/WI Director Jay Heck testified before a joint committee of the Legislature with very different recommendations that would strengthen, not weaken transparency, and limit the influence of money in our elections, not increase it. You can read his complete testimony here. 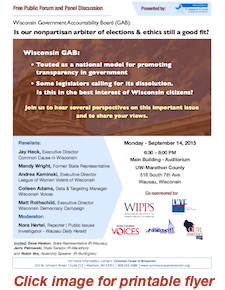 On Monday, September 14th, CC/WI has organized a free public forum in Wausau for citizens to attend and hear about the battle over preserving the nonpartisan GAB and why it is so critical for Wisconsin. If you are anywhere near Wausau (or even if you're not! ), please join us for what will be an informative, interesting and lively discussion. Next week, on Tuesday, September 8th, legislative supporters of nonpartisan redistricting reform legislation, Senate Bill 58, will launch the effort to advance the measure with the goal of having it passed, enacted into law, and be in place before the next redistricting process occurs in 2021. The "launch" will occur at 1:30 PM in the Assembly Parlor of the State Capitol in Madison. State Senator Dave Hansen (D-Madison) and State Representatives Dave Considine (D-Portage), Mark Spreitzer (D-Beloit) and Lisa Subeck (D-Madison) and possibly others will join CC/WI Co-Chair and former Republican strategist and adviser Bill Kraus to discuss the effort. And then on the following day, September 9th, Hansen, Considine and Spreitzer will be joined by State Representative Eric Genrich (D-Green Bay) and by CC/WI Board Member Roger Utnehmer of Sturgeon Bay for a press conference at the Brown County Court House in Green Bay at 11:00 AM. Reform advocates and supporters of ending gerrymandering are welcome to attend both events! Finally, Scott Walker's controversial proposals to try to do away with the "Wisconsin Idea" as part of the University of Wisconsin System mission statement, his very substantial, proposed cuts to the UW budget, and his advocacy for ending tenure have brought national attention as he runs for the Presidency. In this recent article in The Chronicle of Higher Education, Walker's policies are examined and CC/WI's Jay Heck provides political analysis. We at Common Cause in Wisconsin wish you a happy, relaxing and safe Labor day weekend! We will be back very soon with further updates. GOP Legislators Plan to Eviscerate the Nonpartisan GAB and Exempt Politicians from "John Doe" Law This MonthTweet this!